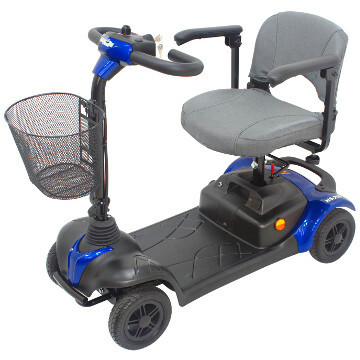 The latest scooter from Drive Medical, it features a modern ultra-compact design which is ideal for nipping to the shops, or for putting in the car boot to take on day trips and holidays. The ST2 has a more powerful motor than the ST1 and its robust design has a higher weight carrying capacity. This model features a padded seat for supreme comfort and stylish black puncture proof tyres. The ST2’s stylish frame splits into two pieces, and can be further split into five smaller pieces for effortless lifting. It has been developed to provide you everything you need for simple, independent convenience at great value. The ST2 carries a 2 year warranty on the frame and motor. The battery carries a 6 month warranty.